With this disc, Lionel Handy completes his survey of Bax’s cello music including the much-maligned Cello Concerto that appeared on an earlier Lyrita disc. Here he performs Bax’s Cello Sonata from 1923 and couples it with the cello sonata of his close friend John Ireland from the same year. 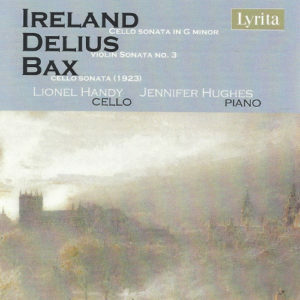 The third item on this disc is Handy’s brilliant transcription for cello of Delius’ Third Violin Sonata. Admirers of British chamber music need not hesitate to explore this new disc for it offers fresh insights on two wonderful sonatas and an entirely new perspective on a third. Handy’s commitment to Bax is cause for celebration as he’s shown himself to be a hugely sympathetic and impassioned interpreter. His recent recording of the Cello Concerto, for example, was a revelation due to his ability to clarify and find depth in what often sounds like a very convoluted score. Here we have the sonata from 1923, which has also received bad press over the years perhaps due in part to Bax having recycled material from his earlier Spring Fire for the sonata’s second movement. Bax’s arrangement of that material is extraordinarily effective but can still seem a little out-of-place for those who now know the earlier score. Still it provides a nice respite from the more frenzied music in the outer movements and one can’t blame Bax for wanting to find use for such great material that he assumed would never be heard in its original form. The last movement of this sonata is truly a tour-de-force and challenges both the cellist and pianist to levels of absolute virtuosic playing. In this and in every other way, Handy and his pianist, Jennifer Hughes, are more than a match for the other fine cellist/pianist teams who have recording this sonata including Bernard Gregor-Smith and Yolande Wrigley on ASV and Paul and Huw Watkins on Chandos. Perhaps Watkins creates a richer, more upholstered sound on his cello but I believe Handy digs even deeper into the score and uncovers more of its angst, tumult and beauty. Watkins and Handy both include Ireland’s glorious sonata and here Watkins’s warmer recording and richer sound are to his advantage in this more restrained sonata but as an interpretation there is no reason to prefer one performance over the other as both Watkins and Handy are in complete sympathy with Ireland’s more melancholic idiom. Watkins rounds off his disc with the York Bowen Cello Sonata while Handy gives us his brilliant transcription of the Delius. Both are rarities and their inclusion adds to the indispensability of both discs. But there are other recordings of the Bowen while the Delius is obviously a premiere and will be of interest to anyone who loves Delius and his serenely beautiful sonata. This new Lyrita disc is beautifully recorded although the balance places Handy’s cello front and center, which I believe adds to the immediacy of these performances. Paul Conway’s notes are superb and incorporate Handy’s own comments on why he saw a need to transcribe the Delius. This is a very thought provoking and persuasive disc from a great cellist who has made a career of exploring and promoting less familiar cello works by major composers. This might be his finest recording yet and I wish it every success.